Home » FasTracKids Blog » Posts » Read for the Record Book Announced! Read for the Record Book Announced! 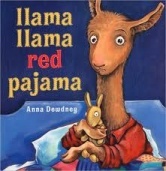 Jumpstart has announced that Llama, Llama, Red Pajama by Anna Dewdney will be this year’s choice for the Read for the Record event! Each year, Jumpstart brings awareness to the crisis in early education by having children and adults participate in the world’s largest shared reading experience. FasTracKids will once again participate in this extraordinary cause and help bring recognition to the importance of literacy for our youth. Over 2 million participants worldwide will hear the story of Baby Llama and his bedtime drama, so please join us and make the pledge to read along with a child!